Start the engine and let it idle until it reaches operating temperature, then turn it off. Remove the oil filler cap A by turning it counterclockwise. Place a large drain pan under the drain plug B . Remove the drain plug B with a wrench by turning it counterclockwise and completely drain the oil. If the oil filter is to be changed, remove and replace it at this time. 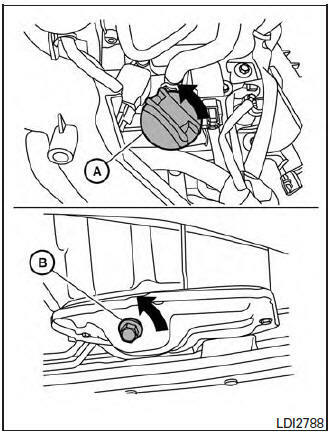 For additional information, refer to “Changing engine oil filter” in this section. Prolonged and repeated contact with used engine oil may cause skin cancer. Try to avoid direct skin contact with used oil. If skin contact is made, wash thoroughly with soap or hand cleaner as soon as possible. Keep used engine oil out of reach of children. Be careful not to burn yourself. The engine oil may be hot. Waste oil must be disposed of properly. Clean and reinstall the drain plug B and a new washer. Securely tighten the drain plug B with a wrench. Do not use excessive force. Refill engine with recommended oil through the oil filler opening, then install the oil filler cap A securely. For additional information on drain and refill capacity, refer to “Recommended fluids/lubricants and capacities” in the “Technical and consumer information” section of this manual. The drain and refill capacity depends on the oil temperature and drain time. Use these specifications for reference only. Always use the dipstick to determine when the proper amount of oil is in the engine. Start the engine. Check for leakage around the drain plug B and oil filter. Correct as required. Turn the engine off and wait more than 10 minutes. Check the oil level with the dipstick. Add engine oil if necessary.